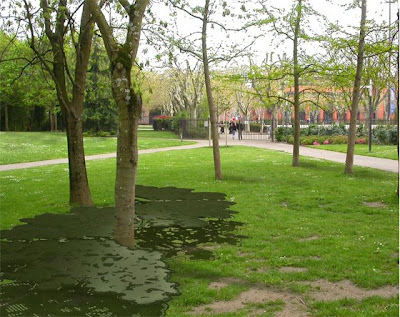 ....this is my favorite design from the results of a contest which "aims at encouraging designers to imagine and create innovative urban furniture to be placed in the Jardins du Fleuriste park in Brussels for a minimum test period of three years" sponsored by Pro-Materia and Buxelles-Environnement. The 2007 theme was 'Let's Hug a Tree", and the gallery of submissions is intriguing and well worth a browse. 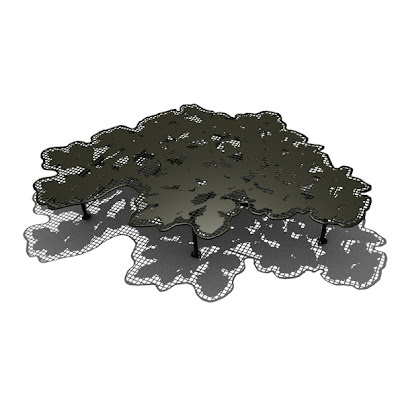 By Anika Perez and Brice Genre, this winning entry is designed to look like the shadows cast by the canopy of a tree. The ethereal made substantial is something I love in a garden. I agree, that is by far the best one, although I thought the Brench, s60 was sort of nice, also. Thanks for presenting these. Awesome, fluid, and so nature-y!